WILLisms.com: Trivia Tidbit of the Day: Part 727 -- Texas Leading Nation Economically. Trivia Tidbit of the Day: Part 727 -- Texas Leading Nation Economically. 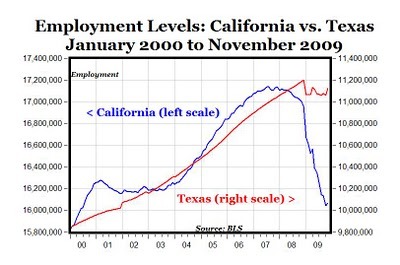 Texas has weathered the current recession better than California for a lot of reasons, and it would be a huge mistake to attribute either all or none of that to the Democrat vs. Republican political divide of the states. Really, it's the ideas that matter. Texas looks more like the America that became the global economic superpower-- limited government. California, meanwhile, once governed by Ronald Reagan, and possessing so much natural wealth and beauty, is beginning to look like some sort of strange dystopian nightmare at the state government level. Texas may be well known for its tasty barbeque, rowdy cowboys and friendly nature, but it also boasts a solid employment base, low tax rates and some of the nation’s most affordable housing. And in these challenging economic times, those qualities can look particularly attractive to families and businesses looking to move to a place where they can plant some roots. So it’s no surprise that more people chose to relocate to Texas in 2008 than any other state, according to Allied Van Lines’ 41st Annual Magnet States Report released today. For the fourth year in a row, Texas took the lead as the No. 1 destination state in 2008 based on Allied’s report, which tracks U.S. migration patterns. Texas achieved the highest net relocation gain (inbound moves minus outbound moves performed by Allied Van Lines) of 1,903 in 2008. Again, the net numbers are the only thing that really matter. Every state is constantly gaining and losing people, constantly gaining and losing jobs, etc. The world still adds people even though people are dying every second of every day, all over the world. Profitable companies still earn net money, even though they are constantly paying out gobs of money toward salaries, rent, travel, materials, and other expenses. The ocean tide still comes in at night despite the fact that it also flows outward toward the sea every few seconds. That's a net gain of water on the beach. This is not rocket science, this net stuff. Avoiding using net numbers for these kinds of measures doesn't make sense. Job numbers use net figures for this very reason. If net numbers were not used, boom times could be made to look like economic collapses. Even after the national recession began, sometime in 2007, Texas avoided declining in employment for roughly a full year. Examining states that created any net jobs at all, Texas added nearly 70% of those newly created net jobs from November 2007 to November 2008. If you include job-losing states in the equation, Texas added far more than 100% of the net jobs gained/lost in the country. "More than 100%? ", you ask. How does that even make sense? That's why economists typically limit their numbers to as much of an apples-to-apples comparison as possible. 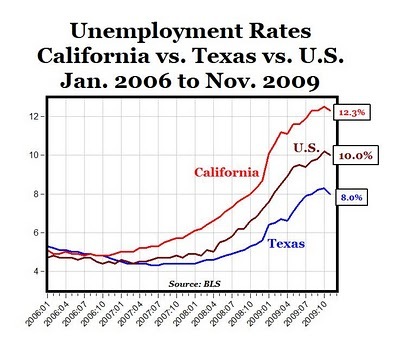 That's also why official number crunchers working for an organization like the Texas Workforce Commission would actually downplay the true strength of the Texas economy by only comparing Texas job growth to the other dozen-or-so states that actually added jobs. Include the whole picture, and it turns out that Texas added far more than 70% of the jobs in America over that period from Nov. '07 to Nov. '08. If anything, the frequent claim that Texas added 70% of the nation's jobs in 2008 is more far modest than it could have been. Previous Trivia Tidbit: Jobs, Jobs, & More Jobs. Disclosure: I work for Rick Perry. As always, thoughts expressed on WILLisms.com are my personal thoughts. See this post, this post, this post, this post, this post, this post, this post, this post, this post, this post, this post, this post, or this post for the reasoning behind that and more information about why you should choose Rick Perry over Kay Bailey Hutchison, as well.